Fitbit set to launch its first ever headphones | What Hi-Fi? Codenamed "Parkside", Fitbit's new headphones could have some form of in-built health tracking, similar to the Bose SoundSport Pulse. 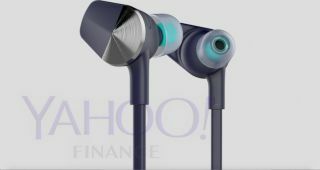 Fitbit is rumoured to be bringing out a pair of headphones in a similar style to Apple's Beats X earbuds, according to images leaked exclusively to Yahoo Finance. Codenamed "Parkside", the phones will come in two colours, 'Nightfall Blue' and 'Lunar Gray', with a slightly metallic accent. Sources say the headphones will be priced around $150 (approximately £115). We don't know much about the headphones yet, but would be surprised if they didn't feature some sort of health tracking software, similar to the Bose SoundSport Pulse. This could include a heart rate sensor to track and record data to Fitbit's iOS and Android app or to its own smartwatch. News of the headphones follows information revealed about Fitbit's newest smartwatch, codenamed "Project Higgs".